If beans in your dessert dip weren’t wacky enough, I'm going to show you how to make pudding & ice cream with spinach and avocado! Please don't write me off as a nutjob just yet, give it a try. As you read earlier, Avocados are one of my newly discovered loves and I was thrilled to score some on sale this week for 3/$1! Although I could have just made bags of homemade pita chips with Ezekiel tortillas & pitas and filled up on guacamole & chips, I wanted to find some new recipes for my new green friends! I can't take credit for the ingenuity of these recipes, but I can promise you they have the stamp of approval from me & Brian. Avocado’s sometimes get a bad rap for being squishy, mushy and green, or full of fat. All of those are true, but the fat they have is heart healthy monounsaturated fat. They are also rich in lutein, folate, vitamin K, vitamin E, and vitamin B5. On average one has 22 grams of fat and 240 calories, but it’s a completely different nutritional experience than 2 oz. of Cheetos that have about the same number of fat & calories and none of the vitamins! I am not suggesting you eat an avocado everyday, but when you do, just know there are a million great ways to enjoy them. I have never been a fan of mayonnaise, mustard, sour cream or most other creamy type spreads. But I do love an avocado slice, or smear on a sandwich. Try that for a swap out inside of your regular options. 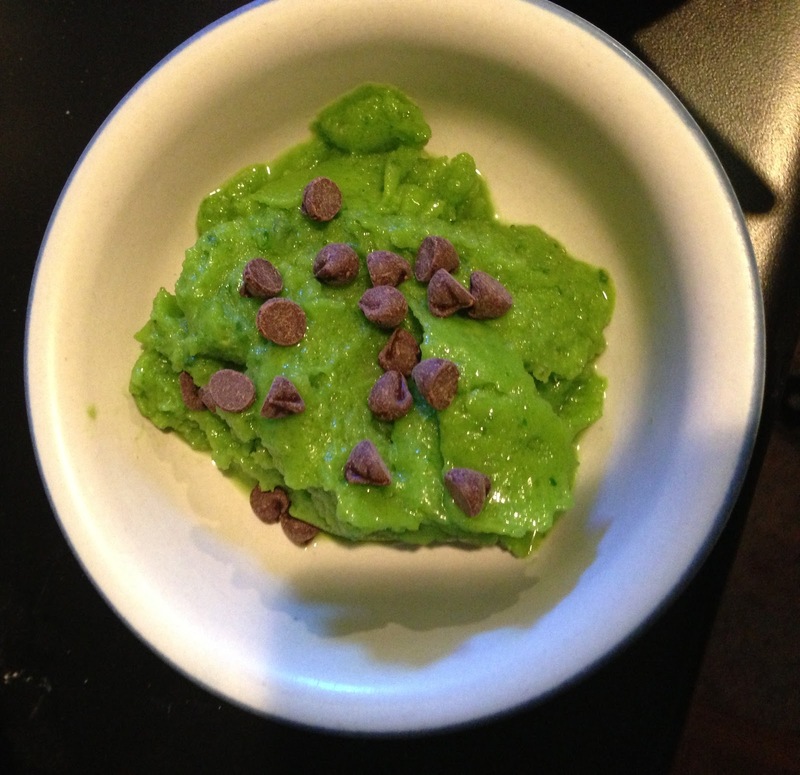 Today’s post is all about using greens in your dessert and enjoying them with a hint of chocolate! I never made chocolate pudding from scratch, but if you do it’s full of heavy whipping cream, sugar and eggs. And if you buy it in a box or premade in those little cups it’s full of Tetrasodium Pyrophosphate (for thickening), Mono- and Diglycerides (to prevent foaming), Red 40, Yellow 5, Blue 1. I don’t know about you, but that sounds scarier than Avocado’s in my pudding! Place all ingredients in a blender and blend until a well combined and a creamy, consistent texture is achieved. 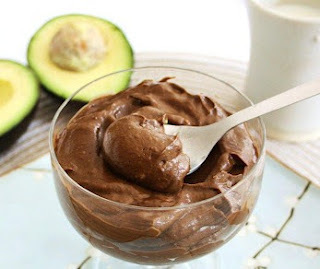 You can serve this pudding straight from the blender or chilled. It makes approximately two half-cup servings or four quarter-cup servings. Add ingredients to the blender in the order listed and blend until smooth. If you have Vitamix, it will be easier, but I just have a blender. I had to stop it a few times and mix the ingredients around. Be patient, it takes a while to blend. Throw the chocolate chips in near the end otherwise they will be too blended. I also toss a few more on top after it is served. It is best eaten immediately. If you find that it is too thick and not blending well add in a splash of coconut (or almond) milk. I have had to do this a few times and it helps it blend when I accidentally add too much ice. Let me know if you have found any healthy ingredients turned into wacky food combo's. I'm always looking for new ways to switch it up!